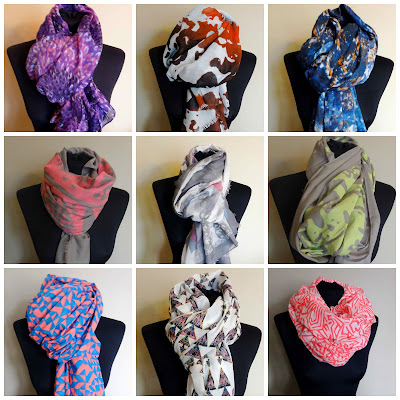 It gives me great pleasure to announce the launch of the School Gate Style scarf shop! We all knew about my scarf addiction so it was a logical progression for the blog I guess. But these are no ordinary scarves - they are beautifully printed, cotton, linen & viscose scarves sourced from a fantastic Scottish company and ordered via a local clothing wholesaler here in Northern Ireland. I've only chosen the scarves that I love and would buy myself and I've pared back costs as much as possible to make them affordable. Please take a look at the shop on this link. Stock is limited but can be re-ordered within a week. Just treated myself to the coral and blue one. Congratulations Avril they look lovely - off for a proper browse! Great idea.......lovely scarves. Good luck ! Cannot wait to get my scarf this week! Good luck with the sales! !